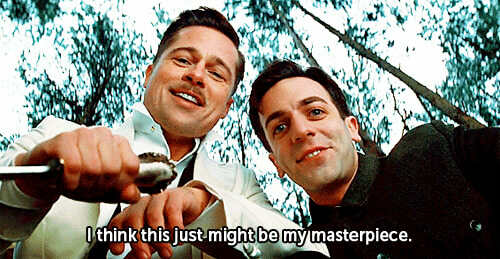 'Inglourious Basterds' set in motion an established universe from which a sequel could build into. If you're like me, you've always tried to keep up with one of the most respectable director/producers in Hollywood, Quentin Tarantino. He has a well-established career of turning out high quality films and bringing truly unique and exquisite movies to his audience. Yet the iconic director has never stopped looking forward to the future - even with his upcoming film, The Hateful Eight, as it hits theaters later this month. The movie follows a group of Jewish-American guerrilla soldiers during World War II as they are sent into Europe specifically to kill Nazis. The group gets spun into a conspiracy to kill several high ranking German officers at a movie premiere, but everything goes wrong as the wheels fall off and the soldiers are forced to improvise in hostile territory against enemies that they can't see coming. It was a great movie, filled with an incredible cast of characters that starred: Brad Pitt, Christoph Waltz, Eli Roth, Melanie Laurent, Michael Fassbender, Daniel Bruhl and Diane Kruger. The huge stuff that I took out could make its own movie, and it followed a platoon of black troops that were court-martialed and they escape. They were in France; they were going to be hung in London and their whole thing was getting to Switzerland. And they ended up getting into an adventure and they meet the Basterds, so I ended up taking all that out. A film following a squad of AWOL and fugitive African-American soldiers as they travel across the French countryside sounds like it's a movie that came straight out of the mind of Tarantino and I would love to see it all play out. Inglourious Basterds set in motion an established universe from which a sequel could build into, and the premise would mesh well with the story of the Basterds - although it would have to be massaged a bit to allow for a new timeline to be interjected. That all sounds great, right? Tarantino already has a plot, it's basically good to go! - Well hold your horses, since Tarantino has also reiterated that there would still be a lot of work needed to make a movie like that. The premise is basically just a removed subplot from the original Inglourious Basterds film, and it would need extensive fleshing out so that it could be crafted into a whole movie. So with all that, we can have some hope because he's obviously thought about a sequel, and with the success of movies like Red Tails and Spike Lee's Miracle at St. Anna - there's definitely room to add a new movie that digs into the experiences that could have happened for African-American soldiers in WWII. Until we hear more, we will just wait and hope, but in the meantime make sure to check out The Hateful Eight as it makes its bloody unveiling in theaters this Christmas. Read next: These 12 Actresses May Be Short In Size But Not In Talent!